5. Why is suicide being presented as a solution, rather than a problem, when the people involved have disabilities? We don’t lack awareness of people with disabilities committing suicide; we do allow vulnerable people to feel shame over chronic pain and depression. Our suicides deserve prevention, not encouragement and cultural misrepresentation, as in films such as Me Before You. What’s the context beyond the medical? 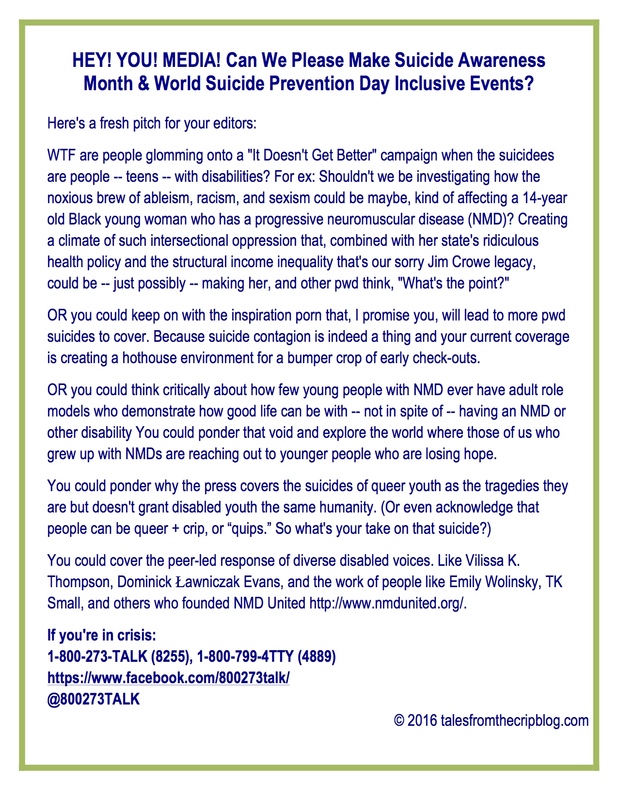 What are the underlying attitudes guiding how the media’s coverage of people with disabilities who have committed suicide or who are planning to do so? This is, as you emphasize, their choice. My opinion is irrelevant. Stop setting me up to be insensitive either to a suicidal person or their surviving family members. Instead, start covering the true scope of the story. Refusing to look beyond the purely personal dimension of suicide is irresponsible when articles about people with disabilities choosing suicide are fast becoming — in the words of your craft — trend pieces. The role of the media is essential — your role is to differentiate between the personal story of an individual, and the investigation and analysis of that singular story within a broader social context. 1. What is it about our healthcare systems that have eroded faith in their ability to alleviate physical and emotional pain? 2. What is it about being vulnerable in our homes, hospitals, and assisted living communities that makes surviving with a reduced capacity to protect yourself more frightening than death itself? 3. Why are we limiting access to drugs that alleviate chronic pain? 4. Why are we not addressing the suicides of people with disabilities as a cluster of public health issues? 6. Does this normalization of suicide for people with disabilities put other people with disabilities and their families at risk for suicide contagion? 7. What policy remedies — regarding structural poverty, access to mental health care, institutionalization vs. in-home services and supports, the violence people of color with disabilities face from law enforcement, to name a few — are our 2016 presidential candidates advancing that could make suicide less desireable? Still not seeing what the big deal is? a. The outfits these young women choose to wear while they die. b. Their right to choose to die. d. How inspiring their courage to die on their own terms is. e. Nothing — you do “real news,” not Style-section fluff. f. No story, just a photo essay of selfies. g. How much better the care was that your terminally ill cat got. h. The concurrent affects of race, sexual orientation, income level on the existing gender discrimination. i. The burden on their family of having female people in it. j. The cumulative effect of barriers to education, employment, housing, transportation, assets, self-determination combined with secondary depression over an incurable condition.